Most CRM and contact management systems have a way to create subsets of your contact data. Some platforms use tags, while others define campaigns, but I believe groups are the best way to segment your contacts. However you decide to segment your contacts, it’s easier to plan this grouping and tagging before your team starts using your CRM. Salespeople, so they can manage their leads and clients (and not other contacts belonging to other salespeople). Sometimes multiple groups for each salesperson are created to help them segment their contacts (for example, leads, converted clients, and lost clients). Contacts entering different phases of an opportunity. For example, if an opportunity entering the proposal evaluation phase always triggers the same action on your side, you may want to add someone to a group that triggers a workflow or a drip campaign. Significant market segments, so your marketing team can focus their efforts if messaging usually doesn’t cross over between those segments. Market segments for those speaking different languages. Different business operating units. If different staff accesses the CRM, you want to ensure a virtual wall is between those contacts. Recurring events with the same attendees. Create a separate group for those events and their attendees. This image shows group architecture built into the navigation of a CRM. A user can dive into a specific group easily. This particular user is a salesperson, with different groups of leads, as well as some groups for a booking calendar, remarketing, and testing. Group management in a salesperson’s account. Different CRMs use these terms to mean different things, but some have agreed on a few standard definitions. Groups: These are groups of contacts or companies. Usually they’re associated by having the same interests in your products or services, or they may be grouped by who has access to them. Any contacts or companies can be in multiple groups, so be aware of any overlap that may occur. Custom data fields: These are attached to the contacts or companies themselves. These represent data fields that describe the contact or company. Tags: Tags are high-level ways to segment your contacts and companies. You should be able to easily pick out contacts and companies that are tagged with the same tag. Keep in mind that you also want to be mindful of using custom fields or tags to segment your data. There are nuances to the implications of the different tactics, so be sure to talk to the vendor or your consultant if you need direction. Tags are a useful method to segment your contact list, but too many tags can get unwieldy. One way to think of tags is as very important custom data fields. Because they tend to be visually obvious to the user, use them sparingly. 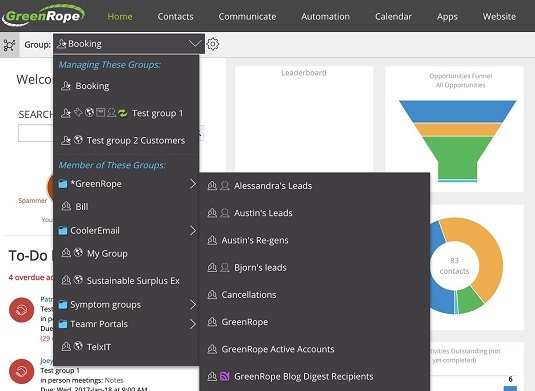 In some CRM platforms, where groups are not used, tags may be your only option. They can used to flag VIP clients, clients in specific geographic regions, clients interested in types of your products/services, or clients with important demographic characteristics. Be sure you work with your CRM vendor to understand what capabilities you have in segmenting your contacts so you can limit access and target those contacts. Below, tags flag a contact visually in a list. 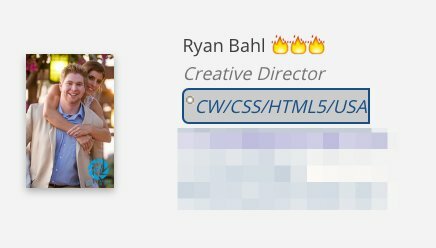 This particular contact has several tags (CW, CSS, HTML5, USA). You should be able to search for contacts based on tags assigned to them and target outbound communication based on those tags. Displaying tags on a contact record for easy identification. Any data you want to store about a contact or a company should fall into a custom data field. Your CRM should allow you to have as many of these as you like, but you want to be prudent with storing and displaying information you never use. Custom data fields: Data should only be accessible to people who have access to a group. Custom data fields give you the ability to limit access to private data. Campaigns: Target campaigns to existing or new members of a group to address specific market segments. Email attributes: You may want to default emails that are sent to a group to be from a particular name or email address. You may also want to specify a default physical address or language to be used. Email syncing: If you want to synchronize emails from your staff with your CRM, using groups to do so is a convenient way to maintain security and privacy. Events: Manage recurring events with invitations and driving registration from all members of a group. Set reminder frequency for events, languages, locations, and more. If you have salespeople who only need to access a subset of the total contacts in your account, or if you have business units that you want to keep separate, groups are a great way to separate access rights. CRM platforms give you the ability to set specific permission levels into different subsets of your account, and using groups is a very easy way to accomplish it. In designing your groups, take into consideration if you want to have only a few people able to access part of your account. Create a separate group for those people. A good CRM platform allows you to have contacts in as many groups as you like, so you can maintain flexibility in your access controls. Check out three users who have access to the group “Austin’s Leads.” These users have permissions defined by the checked boxes. Three shared access users can affect this group.